15 of the Best (and Most Offbeat) Attractions in Rhode Island! Rhode Island may be the smallest state, but it’s home to an abundance of unusual treasures. You won’t have to go very far to find some unique and eccentric sites. From everything you’d ever want to know about H.P Lovecraft to an enormous blue bug, Rhode Island knows how to keep our adventurers entertained. Here are the 15 most unusual attractions in the state. A location significant in the Arts and Crafts Movement in America, this studio is located right along Thomas Street on College Hill. H.P. Lovecraft often featured the building in his stories. 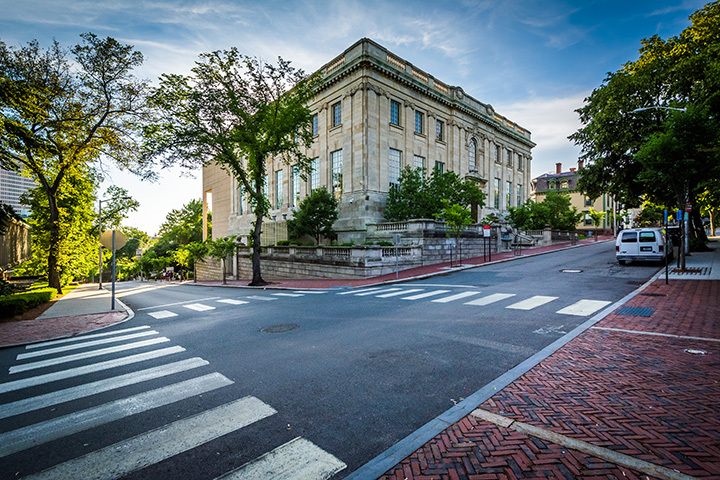 This private museum was founded by Neil Barden Salley, a master’s student at the Rhode Island School of Design focusing in mechanical sculpture. It explores moving parts and how they affect the psychology of the human mind. Branded as a “cabinet of curiosities,” this peculiar museum can only be visited by booking an appointment ahead of time. The birthplace of H.P. Lovecraft, Providence became an inspiration for several of the author’s work. Explore the place where it all started, and where he wrote some of his most popular tales. Shrouded in nostalgia, this abandoned theme park is eroding away in Hopkinton, Rhode Island. While it was sold to private party in 2015, viewers can still see a sign off the street with a magical Humpty Dumpty sitting on it, signaling where the park used to be. Located at Brown University, this library is the perfect reading space for a day, but might also appeal to those looking for a stranger experience. There, you’ll find books bound in human skin and letters written by H.P. Lovecraft. Mercy Brown was rumored to be Rhode Island’s last living vampire. She died at 19 years old in 1892, just after her mother and older sister. Mercy’s body was dug up, found not to have decomposed like the others, and in order to make sure that the curse of vampirism had truly vanished, her friends and neighbors burned her heart and fed the ashes to her brother. “The Bells” is how locals now refer to the crumbling shell of lawyer Theodore M. Davis’s former estate. The dignified manor was a home to a significant collection of Egyptian artifacts. The remains can be found in Brenton Point State park—but they are fenced off and might only be available to view at a distance. “Nibbles Woodaway,” an aptly named termite, is the biggest “bug” in the world, at nearly 58 feet long. He adorns the roof of a pest control center in Providence and is worth driving by—he’s even lit up for the holiday season! Toy Company Hasbro commissioned artists to create several statues of Mr. Potato head, their iconic toy, and place them throughout Rhode Island. Although some of these statues have disappeared over the years, you might be lucky enough to stumble across one while visiting Rhode Island. This esoteric museum boasts several replicas and models of the nation’s first steam engines—the very machines powering the industrial revolution, which got a start in Rhode Island. The museum is run entirely by volunteers, is open on Thursdays or by appointment. Every October, horror fans gather in Rhode Island to embrace the creepiest films of the past and present. Attend a screening—if you dare. Located at culinary arts university Johnson and Wales, this museum preserves the history of cuisine and hospitality. You’ll enjoy learning about the varied history of culinary greats throughout the years! This lovely park boasts the title as the oldest and the northern-most topiary garden in the United States. View over 30 sculpted trees and bushes, all while overlooking Narragansett Bay. Explore the final resting grounds of this iconic author who wrote horror literature, located in the charming and incredibly old Swan Point Cemetery.